I had birthday parties galore to wrap for this weekend and with it nearing the Festive Season as well, I've had to get my 'A' in to 'G' and make up some refreshly wrapped gifts for demo purposes. Always purchasing new gift wrap and/or ribbons can get quite costly so I occasionally like to give myself an eco challenge where I reuse or find wrapping solutions using items around the home. My Christmas theme colours for 2012 are Shades of Green... yes, you read that correctly, not Shades of Grey but Shades of Green. I just LOVE how many gorgeous shades of green there are with my particular favourite for Christmas 2012 being an Olive Green with a Deep Red combination. It's somewhat traditional but the colours are a bit edgy and as a result, create a fresh new look. I've made the picture nice and large for you so you can get an idea of how the Palm Branches look. They are bare and spikey so need very little adornment. I've attached ribbons in Olive Green, Celery Green and Deep Red and it looks great! I'll take another picture that's a bit clearer and post it next time. 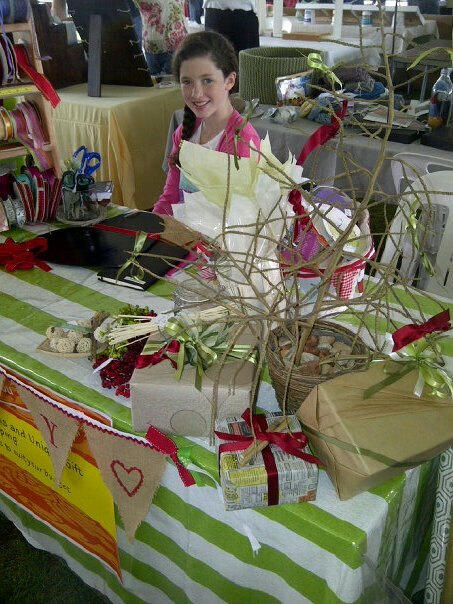 Also in the picture is my very own little helper, my gorgeous daughter Emma! ~ can you see the gift wrapped in Newspaper? I think it looks pretty good! Do you? In keeping with my Christmas theme of Shades of Green and being eco-friendly, I saw someone throwing out rolls of gorgeous Wallpaper after they had finished decorating their offices. What sacrilege! Look how wonderfully this Christmas demo gift turned out! (Now you can see the Olive and Celery Green Satin Ribbon better). And in keeping costs down, I decided to use a different technique for the bow. One that uses half the ribbon I would normally use. 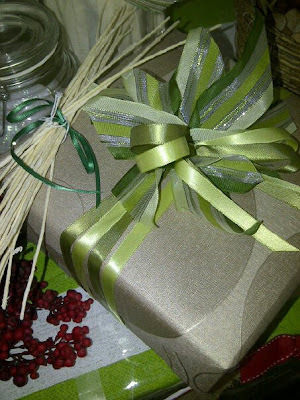 You'll be amazed at what you can find around your home that you can use in your gift wrapping. It has cut down my gift wrapping costs, in these examples, by a quarter to a half, depending on how expensive my gift wrap choice might have been. In the gift below, I decorated it with off cuts of fabric. Bull Denim, Lace, String and even paper Doillies. Below are the Gift Hampers for the Open Door Crisis Centers' fundraising breakfast on the 17th October. I used simple brown craft paper to wrap these and even if I say so myself, they look fantastic! So next time you're stuck for gift wrap options and you just can't get to me to buy some more ribbon or paper, squiz through your sewing basket or through your cupboards with fresh eyes and see if you can create something magical with what you have lying around at home. Oh yes, and a quick tip before I sign off... if you do decide to wrap gifts in newspaper, PLEASE! Make sure you aren't using the 'Racey' ads in the Classifieds or that you aren't wrapping your gift in some awful bad news! :-) This might only leave you with about 3 pages left that you can actually wrap a gift in, but at least you're doing your bit for the environment!